A black hole in a nearby galaxy has let out a couple of belches. Astronomers using NASA&apos;s Chandra X-ray Observatory say they&apos;ve spotted two arcs of X-ray emissions near a supermassive black hole, which they believe are fossils "from two enormous blasts when the black hole expelled material outward into the galaxy." This was observed in the Messier 51 galaxy system, which is 26 million light-years from Earth (pretty close, by galactic standards). 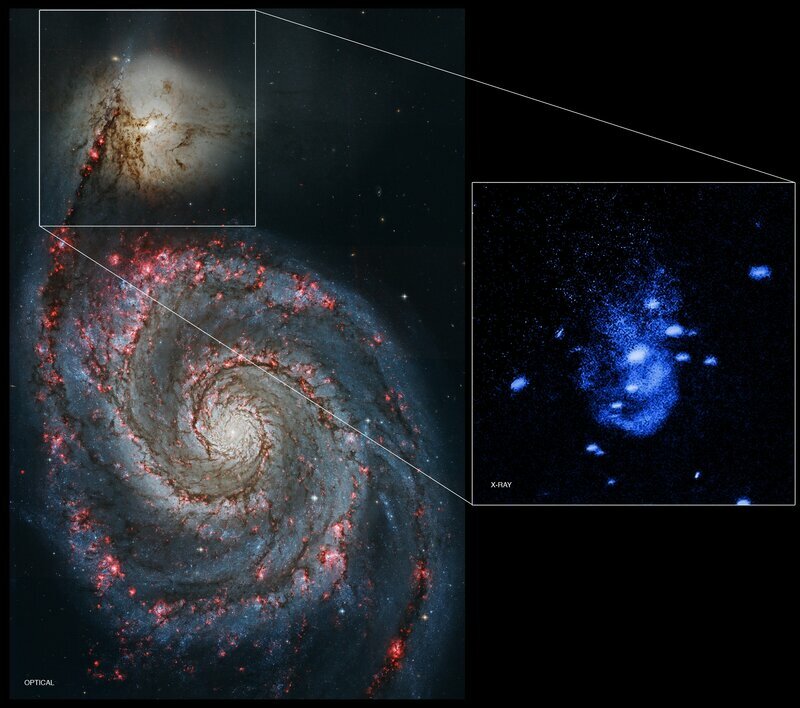 It happened in a small galaxy that is in the process of merging with a larger one nicknamed "The Whirlpool," NASA says. "For an analogy, astronomers often refer to black holes as &apos;eating&apos; stars and gas. Apparently, black holes can also burp after their meal," Eric Schlegel of the University of Texas, San Antonio says in NASA&apos;s press release. Schlegel, who led the study, says the observation "is important because this behavior would likely happen very often in the early universe, altering the evolution of galaxies." And significantly, "this shows that black holes can create, not just destroy," says co-author Marie Machacek of the Harvard-Smithsonian Center for Astrophysics. The scientists say that the hot gas is sweeping cooler hydrogen gas forward much like a snowplow — an example of a supermassive black hole "affecting its host galaxy in a phenomenon known as feedback," according to the NASA release. In an email exchange, Schlegel says the feedback can help regulate the size of a black hole by "blowing gas back out through the central portion." Otherwise, he says, a black hole that keeps eating and picking up matter "could become large enough to engulf a galaxy." And as the snowplow effect sweeps material away, Schlegel says, "the expanding gas could also trigger star formation outside of the central volume." "[T]he researchers spotted twin arcs of X-ray emissions from the black hole in question, which they believe to be the aftereffects of a big meal that happened millions of years ago (the jets, they say, would have taken 1 million to 6 million years to reach their current positions)." It&apos;s rare to actually see these emissions of hot gas from black holes. As the Postreported, "it was only in late November that a research group claimed to have caught the entire process (the entire star meal, if you will) with belch included." The black hole observed in November was much farther from Earth — 300 million light-years away.